Nielsen Reports say that in the US, the average person is exposed to between 500 and 1,600 advertising messages per day. As we are only awake an average of 1000 minutes a day, this statistic underlines the import of mass media (and advertising as a subset) in our modern, work-a-day lives. It is with an eye to social commentary, at a time when mass media is present in almost every moment of our waking lives, that the art of Michael Anderson is most relevant. Exclusively utilizing billboards and street posters, Anderson’s work is both confined and defined by a fixed scale, easily digestible messages and pop culture imagery. The artist strips the original advertisements of their power of persuasion and uses them for something much more complex and insightful. Seducing our undisciplined attention spans, Anderson adds emotional dimension and narrative to images that originally held none. Abstraction and representation collide; repetition of specific fragments of imagery, some static and others swimming, mingle to hypnotize the viewer, luring him to decode the non-linear message hidden beneath the bright, enticing surface design. “I make art about the world we live in,” says Anderson. Apparent in the artist’s work is a deep appreciation for graffiti art. In graffiti, letters often become so abstracted that they lose all legibility. Taking texts from advertisements, Anderson similarly renders the words almost undecipherable as he creates something unique and absorbing. He deconstructs, distorts, and then combines to generate a feeling of motion and energy in dazzling, mosaic-like images that fluctuate in optical pattern and cultural reference. Also evident in Anderson’s work is the obsessive method behind the assemblage of each piece. As an ongoing process, the artist has meticulously hand-collected images from posters acquired in the dead of night on his travels to Germany, Mexico, and Italy as well as on the streets near his home in Spanish Harlem. A visual topography of these vibrant ethnic neighborhoods is layered deeply in each work, collectively driving its pulse and frenetic energy. ”When you see remnants of torn down posters, that’s my tag,” he says. Like a sculptor, he layers and repeats shredded images into a visual staccato that he brings together, creating an elaborate and wonderful tapestry. 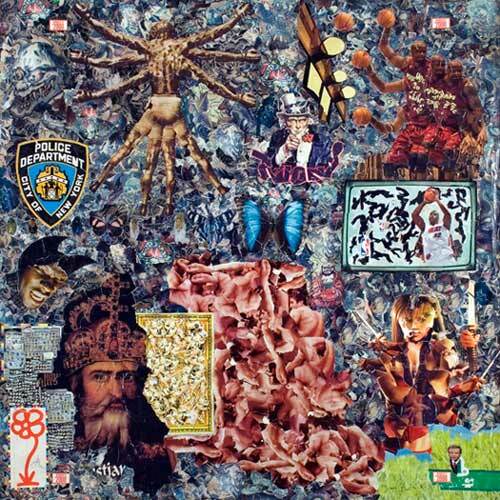 Arranging new world orders, sacred battles and mythological manifestos in the pop-bright kaleidoscope of collage, his works resonate with cryptic possibilities; Anderson thus plays both critic and participant. Michael Anderson’s work will be prominently featured in the upcoming exhibition Beyond Bling: Voices of Hip-Hop in Art at the John and Mable Ringling Museum in Sarasota, Florida opening May 2011. The Artist’s collages are included in the upcoming Scala Publication on hip hop influence in contemporary art. Anderson’s first solo exhibition with Claire Oliver Gallery opens November 18, 2010. For further information please feel free to contact the gallery. This entry was posted on Tuesday, August 10th, 2010 at 5:19 pm and is filed under Uncategorized. You can follow any responses to this entry through the RSS 2.0 feed. You can leave a response, or trackback from your own site.